Since 1950, Bentley Publishers has helped professionals and do-it-yourself mechanics by publishing highly detailed automotive manuals and time-saving service guides. We started by reprinting and distributing hard-to-find British car manuals, such as Austin-Healey, MG, and Triumph. Today we offer a robust line of drivers handbooks, workshop manuals, and parts catalogs for British car owners and enthusiasts. In 1979 we began publishing Volkswagen official service manuals, starting with the Volkswagen Type 1 Official Service Manual: 1970-1979. Soon afterwards, we also began publishing repair manuals for Audi as well. Our line of Volkswagen and Audi technical repair manuals continues to grow and now includes Volkswagen and Audi official factory repair information in both paper and electronic format. 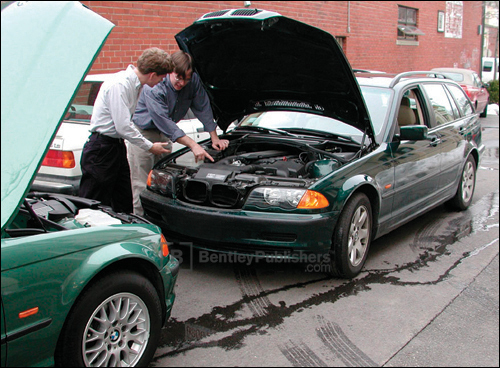 In 1990, we recognized a need for BMW repair information in independent shops and among do-it-yourself owners. We decided to fill this need by purchasing a BMW 3 Series (E30) and authoring the manual ourselves. Many years later, our line of BMW repair manuals reaches across the breadth of BMW platforms to cover everything from the durable E30 3 Series to the technically-advanced E90 3 Series. This process of tearing down a car, authoring the repair information, and taking our own photography now extends to our expanding line of Porsche and Mercedes-Benz books as well. Everything that goes into a Bentley manual - from developing the outline, to meticulously disassembling the vehicle (and putting it back together again! ), to taking hundreds of photographs of component locations - is done by our team of Technical Editors right here in our Cambridge, MA studio. In authoring our manuals, our approach has been to go for the details, resulting in books that may look intimidating, but are easy to use. More detail and less "averaging of facts" leads to less guess work when you are working on a car. We regularly supplement the technical information in our repair manuals with additional procedures that further illuminate tricky repairs, technical DIY videos that we film in our studio and in the field and much more. You can find this supplementary repair information divided up by vehicle marque in our Online Technical Library. If you have additional technical questions that are not covered in one of our manuals, we encourage you to participate in our Technical Discussion Boards. Separated by vehicle marque and subdivided by vehicle platform, this message board is an excellent way to interact with our Service Publication Editors, knowledgeable technical experts and dedicated enthusiasts. 2013 - Our Porsche 996 repair manual wins a Silver Medal in the "Books - Technical/How to do it" category at the International Automotive Media Competition. 2011 - Our Porsche 996 repair manual is honored in the "Professional, illustrated - Book" category at the New England Book Show. 2011 - Our Audi B6/B7 platform A4 repair manual awarded "Best in Category for Professional, illustrated - Book" at the New England Book Show. 2010 - Our Volkswagen A5 platform Jetta manual wins a Bronze Medal for "Books - Technical/How to do it" at the International Automotive Media Competition. 2000 - Our Volkswagen A4 platform Jetta, Golf, GTI manual wins a Silver Medal in the "Books - Technical/How to do it" category at the International Automotive Media Competition. 2000 - Our Porsche 911 Carrera: 1984-1989 manual wins a Bronze Medal for "Books - Technical/How to do it" at the International Automotive Media Competition. 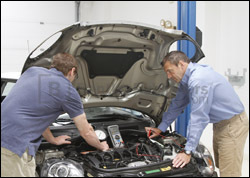 Bentley technical editor checking for voltage at engine harness on a Porsche 993. Service Publications editor conducting technical photography session for our Volkswagen A5 Rabbit, GTI manual. Bentley technical editors testing fuel pump on the MINI Cooper S engine. Bentley technical editors removing drive belt prior to servicing a Porsche 996 3.6 liter Carrera coupe. Bentley technical editors photographing and studying a Mk1 Audi TT Roadster.